The building that now houses the 4-star hotel Régent Petite France dates back to the 15th century. Before opening as a luxury design hotel in 1992, it was an ice factory until the 1960s, producing blocks of ice for local brewers and merchants. The machines that were used to make ice are now on display behind glass walls in the lobby, and in the hotel's ice machine museum. 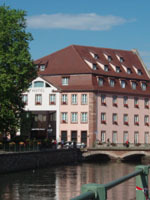 As its name indicates, the Régent Petite France is located in the heart of Strasbourg's picturesque historical quarter "Petite France". With its half-timbered houses from the 15th and 16th centuries, the Petite France quarter is very popular with tourists. Most of the area is a pedestrian zone, so hotel guests are not likely to be disturbed by noise. Strasbourg's city center with the world-famous Cathedral is easily accessible on foot. The hotel's restaurant is named "Le Pont Tournant" after the revolving bridge just next to the hotel. Its summer terrace offers a unique view on the Ill river and passing boats. The menu offers classical French cuisine with an Alsatian touch as well as an extensive wine list. Before and after dinner, guests can relax in the hotel's champagne bar. As the restaurant is rather small with only 40 seats, breakfast is served in the breakfast lounge connecting to the main lobby. This area can easily be transformed to accommodate large groups for business lunches, gala dinners, or cocktail receptions. Room service is available around the clock. The Régent Petite France's 72 rooms are subdivided into five categories: Standard, Superior, Deluxe, Junior Suite and Suite. Room categories are determined by room size and view. A particularity of this hotel is that due to its location in a historical building, no two rooms are alike. Attic and duplex rooms are particularly popular. The modern but cozy interior design contrasts well with the historical architecture of the building. Guest may choose between rooms with queen size, king size or twin beds. Extra beds and baby cots are available upon request. Most rooms, even in lower categories, have sitting corners. The ensuite bathrooms are always equipped with bathtubs, the toilet is separate. All rooms come with individual air conditioning, large closets, minibar, safe, writing desk, telephone and flat-screen TV. Pay-TV is available, as well as high-speed internet access. Upon check-in, guests' cars and luggage are taken care of by a bell man. While the hotel offers no large spa, there is a small wellness area with a sauna and stationary bicycle, which can be used by the guests free of charge. During the warm season, deck chairs are installed on the private terrace. Concierge services of all kinds are handled by the front desk 24 hours a day. The hotel Régent Petite France has four conference rooms, of which the largest fits up to 40 persons. A small business center is located on the ground floor, and high-speed wireless Internet access is available in the rooms. The hotel offers to organize receptions for up to 120 people as well.